Is the message of the cross, suffering and the passion of Christ only relevant during Lent? It seems to me that we tend to focus on the way of the cross only after only after we focus on the ways of the flesh of carnival. Spiritual practices are preluded by carnal ones, which seems to me quite antagonistic. The cross is then a small interval in our self-absorbing lives, rather than a daily practice as Matthew 16:24 suggests. Either way, thinking about the message, or the way of the cross, carries tremendous significance for all segments of Christianity today, regardless of times and epochs. All major Christian traditions relish the way of the cross in different ways. The Catholic tradition for example, venerates this way which is often called the Via Dolorosa. To this date, Catholics from all over the world visit the Old City of Jerusalem to pilgrimage in the footsteps of Christ. This pilgrimage preludes a new experience, marked by 14 “stations of the cross”, all of which lead the individual into being and thinking more Christ-like. On the other hand, the Reformed tradition, Anabaptist, and consequently the current evangelical segments, tend not to assign theological significance to the act of pilgrimage itself. Rather, the tendency is to emphasize the Biblical narrative as God’s revelation in telling the story of Christ through is suffering, death and resurrection. This does not mean that Catholic thinkers do not reflect on the cross in the light of God’s revelation, but that Protestant/Evangelical traditions attach little significance to the practical act of pilgrimage of the Via Dolorosa, as walking in the footsteps of Christ. The path is nonetheless important. There is much speculation about what exactly was the path taken by Christ on the way to Golgotha, where he was crucified. Both the Catholic tradition and Eastern Orthodoxy maintain that Christ was crucified and buried promptly at the place where today stands the Church of the Holy Sepulcher, in Jerusalem. Reformed/Evangelical traditions do not find historical or archaeological basis for these statements, and think that the most likely place is the Garden Tomb, which is just outside the city gates, as the Gospels narrate. Regardless of tradition, scholars believe that this path was of around one (Roman) mile. In the way of the cross, there is a deep theological truth that goes beyond historical facts or archaeological speculation. For Christ, the way to Golgotha ​​ultimately resulted in his death and his subsequent resurrection. But for us, symbolically speaking, the last mile towards Golgotha ​​is the path that leads out of the turmoil of the multitudes and the noise of the city, to a secluded place of solitude. This path leads us to a place of deep reflection, a place of death to self and crucifixion, or as its original meaning of Golgotha implies, a place of a skull. In the biblical narrative, it’s in the way to Golgotha that ​​we find a man named Simon. Matthew 27:32 tells us that he was from Cyrene, a city located in northern Africa. It is very likely that Simon was an African Jew that was in Jerusalem because of the feasts of Passover and Pentecost. The scenario then explains that Simon was walking around the city, coming from the country with his two sons. He was probably in a cheerful mood, as the Passover Feast would suggest. Suddenly, Simon finds himself in a complicated situation. He crosses paths with Jesus, who had just experienced something completely different. Instead of joy among family, Jesus had undergone a trial among adversaries. Instead of coming into the city to party, Jesus was carrying a cross outside of the city, to a place of death. At that time, the Roman Empire had a law that required citizens of the imperial provinces to carry for 1 (Roman) mile anything that the Roman army required. Citizens were forced to carry weapons and other supplies when the troops were moving. So by law obligation, we see that Simon was forced to carry the cross of Jesus, as Jesus was a prisoner of the empire about to be executed. This order forced Simon to drop everything he was doing, his intentions, his plans for the party, to identify with Jesus by carrying the cross of a political prisoner and enemy of the Sanhedrin. This story teaches us a principle. Even today, when we cross the path of Jesus, we are required by his Word, the Law of the Spirit, to take an attitude similar to that of Simon of Cyrene. Instead of the mandate from Caesar, we are faced with a mandate from God. Remember that the whole of Jerusalem was in an uproar because of the Passover and Christ’s crucifixion. His conviction had become a public episode and by reason of the Passover Feast, where the Romans freed a political prisoner to win the hearts and minds of their subjects, the citizens of Jerusalem had chosen Barabbas. 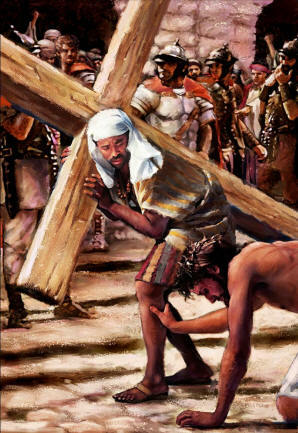 In carrying the cross, Simon had identified with the condemned Jesus. More than that, to the Jews, Simon had identified himself with a blasphemer who claimed to be the Son of God. Simon had identified with Christ in his shame, weakness and apparent defeat. Even the disciples had already deserted Jesus, not wanting to receive the same sentence and persecution that he received. In the way of the cross, Christ was exposed to humiliation the world (Roman Empire) and religion (the Jewish Sanhedrin). Both attacked, insulted, spat and shamed the supposed Messiah. Unlike the disciples, Simon was there, feeling in his own flesh the humiliation. Perhaps feeling the remnants of spits touching his skin. Maybe even the weight of the stones and insults cast against the agitator Jesus. Simon was forced to identify with the shame of Christ. The shame of when God seemed to be too weak to defend himself and proved to be false by the defeating of his plans. The last kilometer towards Golgotha ​​is the way of the cross for all of us today. Simon is compelled to identify with Christ when the world, the Roman Empire, and religion, the Sanhedrin of the Jews, had condemned him as false and powerless. Simon’s story in Matthew 27 raises some questions for us today. First, how many of us are ashamed today because we are Christians and identify with Christ in light of his apparent absence or weakness in solving the world’s suffering ? For obligation of Roman law, Simon could not just drop the cross and move away from Christ. But how many of us today are quick to flee from the shame of identifying with the suffering Christ in order to save our own image? How far are we willing to carry the cross and to identify with Christ in the eyes of the world and religion? In a way, we tend to think about the cross of Christ and the death it beckons only during Lent. However, identification with Christ in His death is a daily and continuous action, irrelevant of the time in the liturgical calendar. Perhaps, what is most striking about this story is the fact that not once Christ defended himself. Jesus knew that the persecution was a God’s tool for the fulfillment of his mission. Suffering and death was the prelude to something new. The reality of Christ’s death urged how the disciples were live their lives. Similarly, Christ does not promise us that we will have no persecution or suffering as his followers. What God does promise is a resurrection, a new life in the power of His Spirit. Nonetheless, this resurrection is only achieved if we identify ourselves with the crucified Christ, according to Simon’s example in the last mile towards Golgotha.